“- Beloved Brethren... 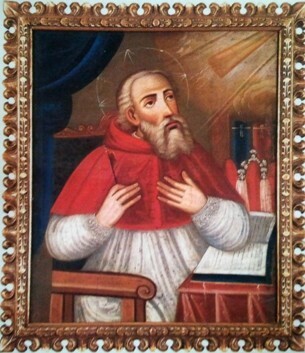 I, SAINT IVO, servant of the LORD, of MOST HOLY MARY AND OF SAINT JOSEPH, COME FROM HEAVEN TO TEACH YOU THE TRUE LIFE THAT PLEASES GOD, THE LIFE OF VIRTUES, OF LOVE, AND OF HOLINESS. TO ACHIEVE VICTORY OVER YOURSELVES AND YOUR VICES, YOU MUST OPPOSE TO YOUR VICES THE VIRTES OPPOSITE TO THEM, CONTRARY TO THEM. If your greatest VICE IS SENSUALITY, you must oppose to it, the VIRTUE OF PURITY, of CHASTITY, of CONTINENCE and of MORTIFICATION OF THE SENSES. If your greatest VICE IS PRIDE, you must oppose to it, the VIRTUE OF HUMILITY. If your greatest VICE IS CALUMNY, you must oppose to this vice the VIRTUE OF SILENCE. If your greatest VICE IS GLUTTONY, you must oppose to this vice the VIRTUE OF ABSTINENCE. If your greatest VICE IS PRESUMPTION, you must oppose to this vice the virtue of SELF HUMILIATION. If your greatest VICE IS REBELLION AND DISOBEDIENCE, you must oppose to this vice, the VIRTUE OF OBEDIENCE, of READINESS and of CONFORMITY. SO, FOR EACH VICE THAT YOU HAVE, YOU MUST OPPOSE TO IT THE CONTRARY VIRTUE. Many live deluded, thinking that it is enough to just do some practices of devotion in front of God and He will be satisfied, but without making war against our personal flaws. They are mistaken! THE LORD IS HOLY! Nothing spotted can enter in His Home in Heaven. THE ONLY ONE WHO WILL ENTER IN THE KINGDOM OF HEAVEN IS HE WHO IN THIS LIFE FOUGHT BRAVELY AGAINST THE GREATEST ENEMY OF ALL: THE ‘I’, INCLINED TO EVIL AND CORRUPTED DUE TO ORIGINAL SIN. Only struggling against your own ‘I’ inclined to evil and corruption due to original sin. Only struggling against you own ‘I’, the soul can move forward more each day on the path of holiness and can be pleasing to God’s eyes. You must struggle to get this perfection, but nobody will get to have a resolved spirit and a firm will of doing it if they do not PRAY. PRAY THE ROSARY AND DO NOT STOP PRAYING IT FOR ANYTHING! THE DAY IN WHICH YOU STOP PRAYING THE ROSARY BECAUSE OF THE EXCESS OF THE SOLICITATIONS AND OF TEMPORAL ACTIVITIES THAT MANY TIMES YOU SCHEDULE FOR YOURSELVES, YOUR SOULS WILL LOSE THE BATTLE AGAINST YOUR VICES AND AGAINST THE DEVIL THAT IN EVERY MOMENT SPIES ON YOU TO SEE THE MOMENT IN WHICH YOU NAP AND STOP PRAYING TO THEN MAKE YOU FALL IN SOME SIN AND LOSE YOUR ETERNAL SALVATION. ALWAYS MAINTAIN A LIFE OF DEEP PRAYER, OF INTENSE PRAYER AND OF SURVEILLANCE, ALWAYS FLEEING FROM EVIL AND SEEKING THAT WHICH PLEASES GOD AND HIS MOTHER. I will help you and will pray for you on the Lord’s Throne... The blessed AMÁLIA AGUIRRE, whom you today contemplate in this feast of the LADY OF TEARS will also will be praying with me for you. Look how much she suffered, look how she was the victim of so many injustices, of many slanders, how her cross was heavy, how her cross was horrible... Yet, she carries her cross for love to GOD and the LADY OF TEARS with PACIENCE, with FAITH, with PERSEVERANCE until the end and that's why She won an imperishable Crown in Heaven, because she loved much. She loved on the cross... She loved in the Sorrow, she loved in the trials of the contrary appearances, she loved in the abandonment of Earth, and she loved despite all the things that were opposed to Her... So she can help you a lot, she can teach you the perfect and holy life that God and His Mother expect of you. I, IVO, will pray intensely for you on the Throne of the Lord and I will pray especially for you, Marcos, My dear friend, to whom I love so much, I protect so much, I defend and accompany. You are mine! Thus, I also am yours and together, in one heart, in one soul we live to live, please and glorify God. My favorite, I love you and bless you now and to all those who sincerely believe in the Messages of these Apparitions and strive to put them into practice!